Why Won't My Charcoal Grill Get Hot? Weber may not have invented charcoal grills, but we have come pretty close to perfecting them. Despite all the cool features and advancements that have been made to our charcoal models, grilling with charcoal is still a pretty simple concept. That said, it doesn’t mean things can’t go wrong. Here is a list of things to consider if you are having a hard time getting your charcoal grill hot. If your grill is full of ashes from previous grilling sessions it can impede the proper flow of air inside of the kettle, which makes the coals burn cooler. If enough ash builds up it can make it next to impossible to get the coals to stay lit. It’s important to clean out left over ashes, not only to help the coals burn better, but to help keep the grill in great shape as well. Ashes can trap moisture, leading to corrosion. Keep your grill clean so it works better and lasts longer! Having a high quality brand of charcoal is important if you want to have a good grilling session. Lower quality bargain brands can have a harder time getting hot, staying lit and providing consistent results. How old is the charcoal? Old charcoal can have reduced grilling properties. Has it gotten damp? Wet charcoal will never provide good results, but it will provide lots of frustration. What style charcoal are you using? We tend to recommend using briquette style charcoal, as it burns more evenly and predictably than lump charcoal. Is the charcoal new or used? If you are trying to reuse charcoal that is partially burnt from a previous grilling session it can result in the grill not getting hot enough or the coals burning out quicker than expected. We always recommend using all fresh charcoal each time you are going to grill. How are you starting your charcoal? If you answered lighter fluid, then we can’t be friends anymore. A Weber Rapidfire Chimney Starter is the best tool for getting charcoal burning quickly, evenly and safely. Lighter fluid is pretty dangerous stuff and can leave nasty flavors on your food. Also, it’s important to let your charcoal ash over a little bit until the briquettes are slightly gray. Once they’ve ashed over pour them onto the charcoal grate and arrange the coals depending on how you intend to grill, i.e. direct vs. indirect. Put the lid on the grill and let it preheat for about 10 to 15 minutes. If you’ve accidentally let your charcoal ash over a bit too much before beginning to preheat don’t be afraid to toss a few more coals onto the lit ones. This will help the coals from burning out too quickly. Most Weber charcoal models have three dampers on the bottom of the bowl and one on the top of the lid. While preheating the grill, it is important that all the dampers are fully open. This provides the maximum amount of oxygen to the coals to ensure that they will burn hot enough to get the grill up to temperature. Depending on which grilling method you are using the results can be totally different. Direct heat is best for foods that cook fast, like burgers, steaks, hot dogs and sausages. Indirect heat is best for things that need to grill “low and slow”, such as roasts, whole chickens, ribs, briskets, etc. If you are trying to grill something that needs direct heat, but have it on indirect heat it could lead to the perception that the grill is not getting hot enough when really the cooking method being used needs to be altered. For details on how to setup a grill for different charcoal configurations check out some great tips here. Some Weber charcoal models come with a lid thermometer. Having a lid thermometer is a great tool, but it’s important to remember that it is not the be all and end all of the grilling experience. Never hesitate to adjust your grilling times, damper adjustments or food placement on the cooking grate based on the results you are seeing on the grill. Blind faith in a thermometer can lead to a bad time. They can also lead to false impressions, as they are displaying the ambient temperature of the air that’s close to the thermometer probe inside the grill not the exact temperature of the cooking surface. Our iGrill line of thermometers do a great job of showing you the internal temperature of the food being grilled. Learn more about the iGrill here. 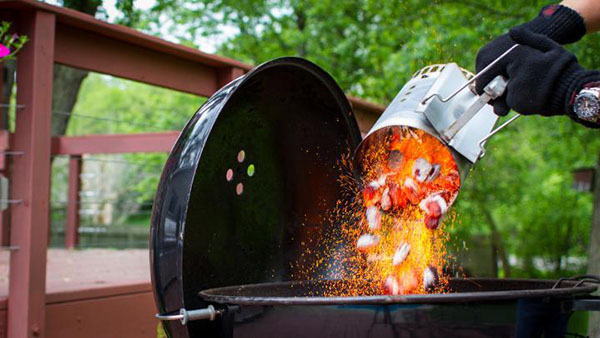 Here are a few other things to consider if you are having trouble getting your grill hot. Altitude At elevations above 5,000 to 6,000 feet the amount of oxygen present in the atmosphere begins to drop and this has a direct effect on the ability to get charcoal burning as hot as it would at lower elevations. There isn’t much that can be done in these cases except for making sure the grill is as clean as possible and the dampers are all fully opened to maximize air flow. Frozen Food We typically advise that any foods you are going to grill be allowed to come to room temperature before attempting to grill them. If grilling the food from a frozen state is unavoidable the total grilling time needs to be extended and adding additional charcoal may be required. Drip Pans If you are using a drip pan in your charcoal grill it can reduce the amount of oxygen supplied to the charcoal, which can result in a reduction of heat inside the grill. Make sure as much of the cooking surface is exposed as possible to maximize air flow. What are you grilling? Obviously you are going to need more charcoal to grill a big pork roast than you will for a hot dog. That’s why it’s important to plan ahead with the amount of charcoal you start your grill with, how much you might need to add while grilling and that you have a good supply on hand for long grilling sessions. Keep these tips in mind the next time you use your charcoal grill and you should have no trouble getting those coals nice and hot!